In October 2016 SPACE for Gosforth arranged a review of recent changes to the Salters Road / Gosforth High Street junction with the Royal National Institute of Blind People (RNIB), the Guide Dogs for the Blind Association , engineers from Newcastle City Council and Zoe the Guide Dog. As SPACE has previously noted, making roads and crossings accessible for people with disabilities is a matter of law and it is unlawful for a disabled person to be put at a substantial disadvantage in comparison to a person who is not disabled. 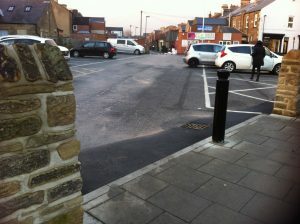 The pedestrian entrance to the car park has a ramp to make it easier to navigate for those using wheelchairs or pushchairs. Designing fully accessible streets, however, goes beyond simply adding in these physical features. 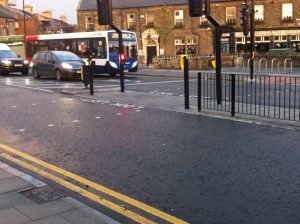 It involves planners and engineers putting themselves in the position of others with a wide range of physical and additional needs and trying to anticipate what will enable them to cross a busy junction safely – and then reviewing how those features work once they have been put in place. It should be seen as an ongoing progress as city streets change over time, rather than a process with a fixed end solution. The volume and speed of vehicles passing through the junction, particularly at rush hour, continues to be very intimidating and frightening. The noise of the traffic is also very loud at times. This is a problem for people with visual impairments for several reasons. The noise can affect a Guide Dog’s ability to hear commands, and it can also affect a person’s ability to hear any assistant or passer-by. Additionally people with visual impairments rely on their hearing more than those who can see. Sight loss may mean they need to use audible clues to gain a sense of what is happening around them. Loud noises may affect their ability to filter out the sounds which are important to them. 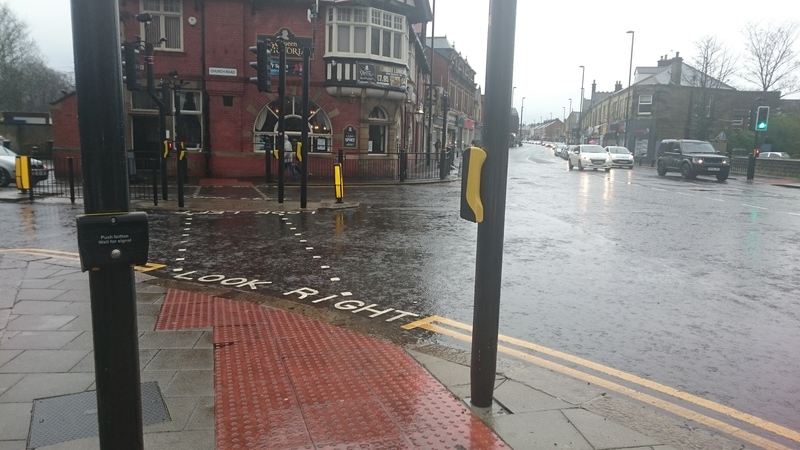 Contrasting colours can also help partially-sighted people navigate the area, but the finished work does not always provide this – for example, the cycle racks out side The Gosforth Hotel do not have a clear contrast with the pavement. This engagement is very welcome, as this junction lies on a walking route between Gosforth High Street and two of the VI ARC schools (Gosforth Academy on the Great North Road, and Gosforth Junior Academy on Jubilee Road), and our streets need to be designed to enable pupils attending the VI ARCs to be able to walk around the community with their families and friends. 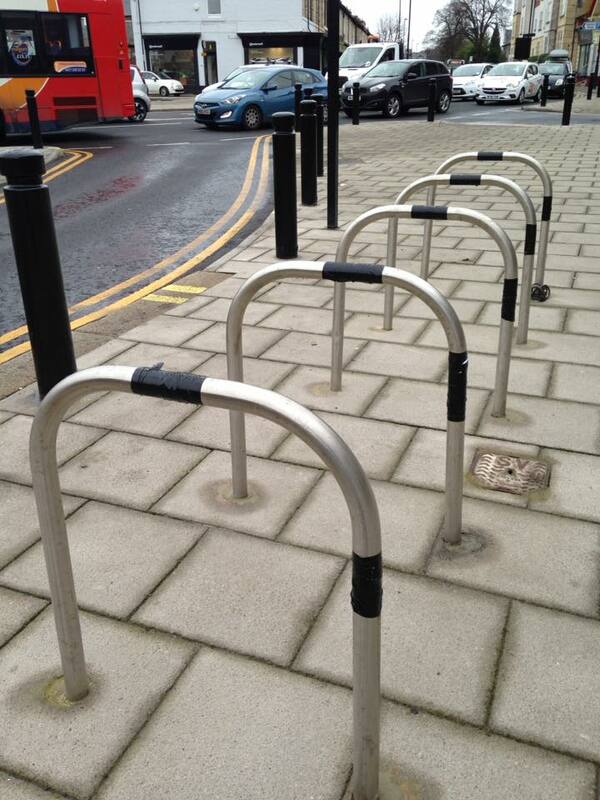 Black tape has been added to the cycle racks outside of The Gosforth Hotel to help create a contrast between the rack and the pavement. To meet best practice it would be better to surround the racks with tactile paving, such as cobble stones, so that there is a clear definition that there is an obstruction on the footway. However, the racks are situated away from the wall of Gosforth Hotel so they do not impede on the “inner line” that people with visual impairments follow when walking along a street. One key issue still remains. 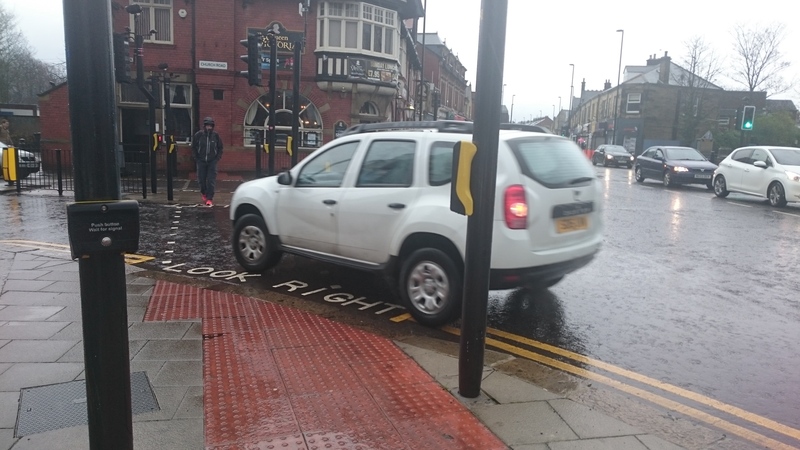 When crossing at the top of Church Road towards the The Queen Victoria the position of the control box is set back from the junction, which means that it is not in the natural position for a visually impaired person to find (especially if walking on the left of the tactile paving). In addition, the curve of the pavement gives the impression underfoot that the pedestrian will walk in that direction, effectively into the middle of the junction. This was not a problem for Zoe, as she knew where to lead her owner to cross safely, but for those people without a Guide Dog it is dangerous. 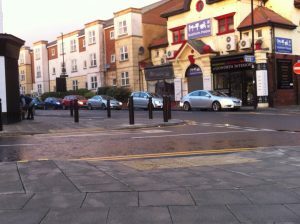 The sweep of the junction also means that drivers increase their speed and come very close to the pavement. For people with sight, we would very likely step back but for someone with a visual impairment a vehicle crossing your path at speed is a terrifying experience. This crossing point would be much safer if the turn was much tighter to slow down drivers turning left. 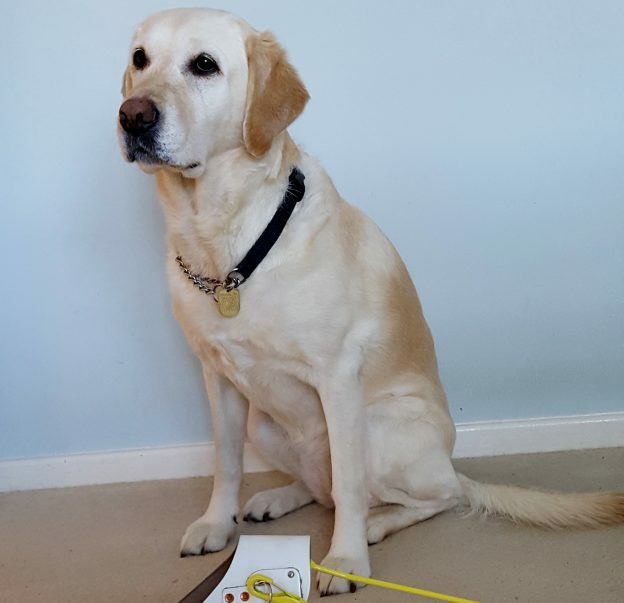 “Having Zoe the Guide Dog as part of the group for the review meeting was important. I own a dog, and well, he’s just a bit thick in comparison to Zoe’s expertise at navigating herself and her owner safely across busy roads and through crowds of people. It was an education studying her behaviour. 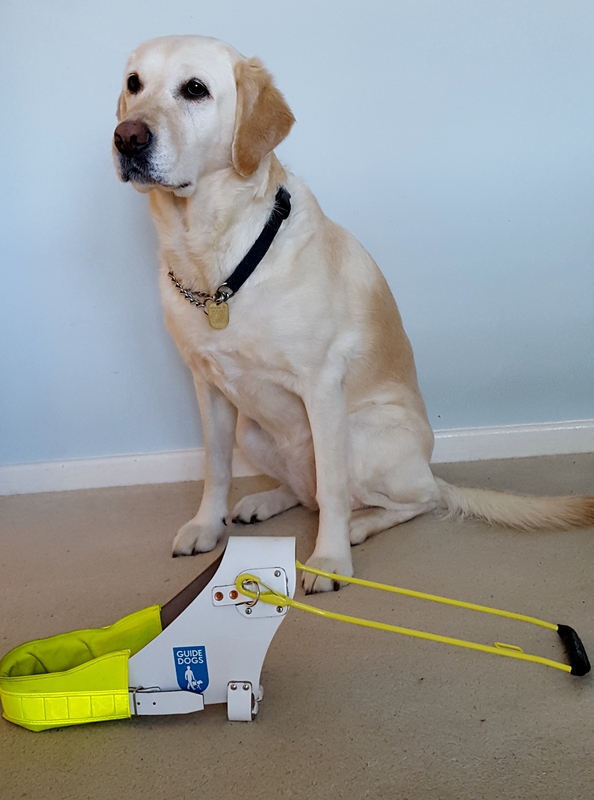 Please do support the fantastic work that Guide Dogs do and we would urge all readers to take action and support the Guide Dogs campaign to introduce legislation across England and Wales to make it illegal for people to park on pavements. 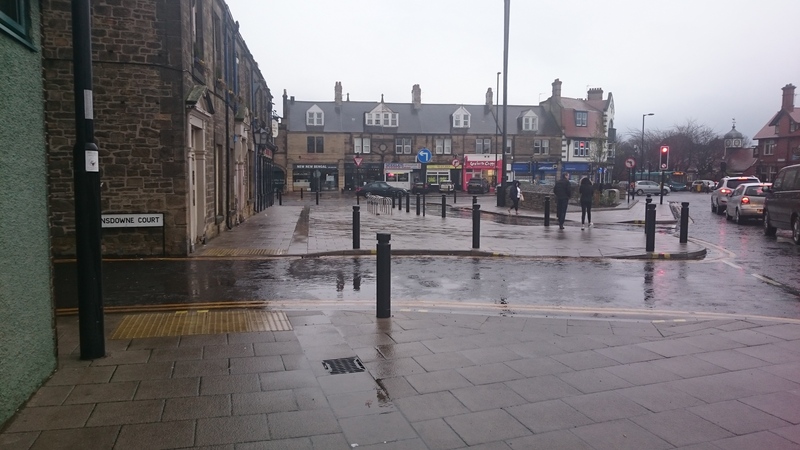 This entry was posted in Accessibility, Gosforth High Street, Safety, Walking and tagged blind walk, Guide Dogs, Guide Dogs for the Blind, RNIB, safety, walking, Zoe the Guide Dog on February 17, 2017 by SPACE for Gosforth. I am delighted to see this Guide Dogs review. In general, what is good for people with visual impairment is good for everyone, but I would just like to point out that ‘tactile paving’ is very difficult for many people with dementia, and the frail elderly, and can make them feel very insecure. I think we need to be very careful when we are modifying the environment to assist some of our citizens not to disadvantage an even larger group of fellow citizens who are often less able to express their views. All users must be considered and an appropriate balance found. Thanks for your comment Beryl. We couldn’t agree with you more, we were aware that some types of tactile paving can cause issues for people with mobility issues, but we weren’t aware of the issue for people with Dementia. Do you have any links to information and ideally recommendations on what is appropriate to enable us to carry out further research?